Remember this? Mary Harney gets painted in November 2010. LAST WEEK IT was a roll of sellotape and this week the Taoiseach’s car had to endure a downpour of eggs. But Enda Kenny isn’t the first politician to have various items pelted at him. He joins an ever-growing list of world leaders and decision makers to have a variety of funny headlines written about such incidences (just Googling “objects thrown at politicians” will throw up almost 60 million results). Shoes, pies and eggs remain the most popular objects to hurl at politicians but some throwers like to be a bit more inventive. Here, TheJournal.ie has documented some of the more famous YouTube-able events of the past 12 years. (We think the woman in the purple dress takes some of the dramatic effect away). 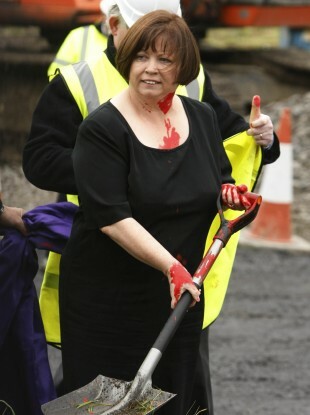 In November 2010, Mary Harney, then Health Minister in Ireland, saw her popularity plummet to such low depths that she had red paint flung at her while opening a new facility at Cherry Orchard Hospital in Ballyfermot (main article picture). Dublin City Councillor Louise Minihan received a two-month sentence and was fined €1,500 for criminal damage and assault after admitting responsibility. The Italian premier had his nose broken and two teeth knocked out when a man attending a political rally threw the statuette of Milan’s Duomo gothic cathedral straight in his face. Berlusconi spent the night in hospital in December 2009 after the incident but appeared in good spirits the next day. The UK’s business secretary Lord Mandelson had green custard thrown at him by a member of the Plane Stupid group which was set up to campaign against a third runway at Heathrow in 2009. Trying to be fair and polite, the thrower – 29-year-old Leila Deen - told the politician it was only custard before she hurled it at him. Back in December 2009, a man was arrested in Minnesota after allegedly throwing two tomatoes at Sarah Palin. Bad aim and Palin’s own good luck saw the guy miss and hit two police officers instead. The incident also inspired this great post from Gawker, defending the tradition of throwing foodstuffs at people we don’t like. And pointing out that tomatoes are a whole lot less offensive than turnips, the first vegetable to be thrown in protest. This is an odd one. Obama had a paperback book thrown at him during a rally in Philadelphia in October 2010 – but the thrower – later described as an “over-exuberant supporter” didn’t mean any harm and he also wasn’t protesting about anything. Why did he do it? Because he was the book’s author and he wanted the president to read it. Obviously. In probably the most famous act in the things-being-thrown-at-world-leaders category is the George Bush shoeing incident of 2008. During the US president’s trip to Iraq in December of that year, an angry reporter let fly. Bush isn’t the only politician to consider footwear a deadly weapon. There is a whole Wikipedia page dedicated to the art of shoeing. Dominique Strauss-Kahn, Tony Blair, Greece’s George Papandreou and the former president of Egypt Hosni Mubarak have all been brought to heel (see what we did there?) by the levelling of a sandal. And that’s without even mentioning Alex Ferguson and the dreaded football boot. Former US President Bill Clinton is a man not so easily flustered. On being egged by an anti-globalisation protester (remember them?) just a day later in Warsaw, Poland, Clinton continued on his stroll while smoothly removing his jacket. He later remarked that it was “good for young people to be angry about something”. Just because you are a megastar, doesn’t mean everyone is pleased to see you. Other mentions here have to be given to non-political figures such as billionaires Bill Gates and Rupert Murdoch for their headline-making pieings. Have we missed any famous throwing incidents? Let us know in the comments section. Email “Shoeing, pieing and 7 other things politicians have had thrown at them”. Feedback on “Shoeing, pieing and 7 other things politicians have had thrown at them”.